Part 2- On January 31, I attended the first day of the Google Apps for Education (GAFE) Summit in Atlanta (see Part 1 of this series for my first impressions). To say, I was excited could be seen as a slight understatement. I was excited to a specific nerd level only seen at video game release. (Okay. Maybe not that level, but still…) This summit was a way to learn great tips, tricks, and information dealing with GAFE. It was definitely a full day that provided the attendees the opportunity to become “mini-experts” for their schools. 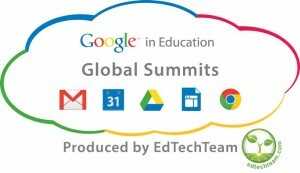 I will explore a little of what I experienced at the #gafesummit. This session explored the potential benefits of using Google apps like Google Hangout, YouTube, etc to create student broadcast which breakout of the traditional mold of student news. Jeff Eller, a Metro Atlanta media specialist, uses his elementary school as the example in this session. He showed attendees the ups and downs of starting a program like this. it was a lot of trial and error before the best formula could be found for success. Now students not only report the news, classes are creating stories for the program like a child skyping with her grandparents in India for her class’s discussion of weather. Teachers are getting into it as well by creating a resource of professional development as well as helping out with broadcasts. Members of the community come in to add their touch to the broadcasts. This was a great session to help get the wheels turning for those who may want to explore this for their school. The last session of the day was a great one for those who want to become Google Apps for Education experts. Google Certified Teacher, Wanda Terral, spoke of her experiences on the road to become a GCT at the Google Teacher Academy in Austin, TX and gave advice on how to best achieve this. Wanda suggested that teachers begin with becoming a Google Educator through their online testing program. In order to become a Google Educator, you must pass 4 required tests over Gmail, Drive, Calendar, and Sites and one optional test over Android Tablets, Chrome, Chromebooks, Google Play for Education (your choice.) Each test is $15, has 60 questions with a 90 minute testing time limit, and all tests must be completed in 90 days from the start date. If you pass all the tests with a minimum of 80%, you will be given a certificate valid for 18 months. She suggests preparing for the tests by using available review resources and setting a timetable to make sure you complete everything. Being a Google Educator is a must when applying for the Google Teachers Academy to become a Google Certified Teacher. In addition to the certificate, applicants must submit an application and a one minute video answering the pre-chosen question. Videos are suggested to not just be a resume but to show examples, be creative, have personality, be memorable, etc. If you are not chosen the first time applying, Wanda suggests to not give up and keep reapplying. Overall, this was a great day and gave so much information to take back to schools. I cannot wait to explore Day 2.